Get cutting-edge information to improve crop breeding and productivity! Crop improvement will become progressively important over the next few decades as the world’s population is expected to top 10 billion people, with more than eight billion in developing countries alone. 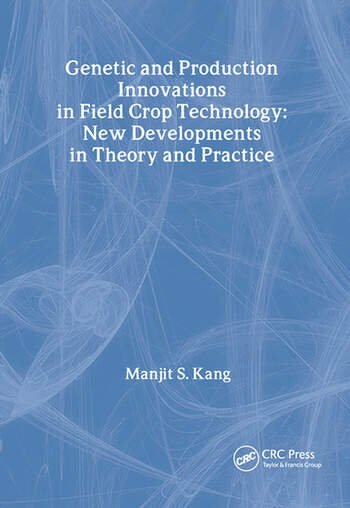 Genetic and Production Innovations in Field Crop Technology: New Developments in Theory and Practice tackles this enormous challenge by detailing the latest available research and innovations for crop breeders and physiologists for the twenty-first century. Respected multidisciplinary scientists comprehensively discuss cutting-edge advances in field crop technology and genetic production as they keep an eye on the goal of providing nutrition to a hungry world. Genetic and Production Innovations in Field Crop Technology emphasizes an integrated approach to solve global crop production problems and increase crop productivity. Crop research experts review methods of globally improving crop yield, food product efficiency, and providing adequate nutrition in diet. The authors discuss various types of field crops, including corn, soybeans, winter wheat, cassavas, rubber, sunflowers, and barley, as well as review the exciting innovations on the food production horizon. The text is extensively referenced and includes useful graphs and tables to clearly present data. Genetic and Production Innovations in Field Crop Technology: New Developments in Theory and Practice belongs in every agricultural university library. Crop breeders, geneticists, agronomists and horticulturists, educators, and students will find this an invaluable research source for now and for the future.